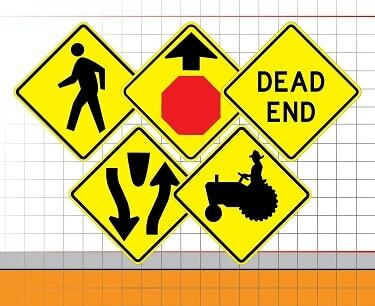 Warning signs are used to alert highway, street or road users to unexpected or dangerous conditions ahead that might call for a reduction of speed, situations that might not be readily apparent, or an action in the interest of safety and efficient traffic operations such as a curve, detour, sideroad, etc. They usually have a yellow or orange background with black symbols or letters on a diamond-shaped or rectangular sign. Yellow pennant-shaped signs caution motorists where passing is unsafe. Round yellow warning signs alert motorists that there's a railroad crossing ahead. Warning signs are made with the highest quality .080 aluminum, coated with the industries best 3M or Avery reflective sheeting and printed to last beyond the sheeting warranty. If you don't see the signs you need we can make any standard or custom relfective sign. 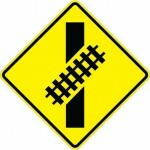 Warning signs can indicate any potential hazard, obstacle or condition requiring special attention. Some of the most common warning signs are the following.